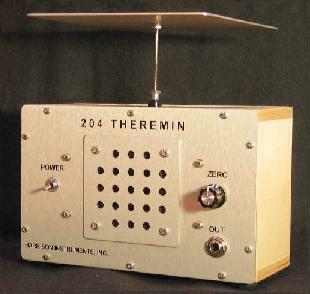 The Harrison Instruments Model 204 Theremin is a complete tabletop pitch instrument with a built-in loudspeaker. It is powered by an internal 9-volt battery, and has an output jack for connection to an external amplifier or effects processor. When used as a stand-alone theremin, the 204 provides a fixed volume suitable for small-group demonstrations, and serves equally well in business and retail venues. The 204's highly stable, low-noise output is well-suited for practice, performance and recording. ©2006, 2013, 2016, 2017 Harrison Instruments, Incorporated. No part of this page may be reproduced without express written consent of the copyright holder. Information, prices and specifications may change without notice.